TSPSC has issued notification for Teachers Recruitment Test (TRT) 2017 to the posts ot School Assistant/Secondary Grade Teachers Language Panditl Physical Education Teacher Vide Notification Noe. 52I2017 to 5612017 for 31 Districts and applications were being accepted online. In compliance with the Orders of Hon'ble High Court. Govt. of Telangana amended the 60 Ms No.25 SE (Gem) Dept. Dt. 10.10.2017 and issued GO Ms.No.33. SE (Gent) Dept. Dt. 11.1.2017 readjusting the vacancies notified for 31 Districts to erstwhile 10 Districts of Telangana State. The revised break up of vacancies which are readjusted to 10 Districts are available on TSPSC website. As such the candidates applying for TRT are instructed to take note of the Corrigendum dated.12.12.2017 and revised breakup of vacancies for 10 Districts before applying for TRT posts. The last date for submission of applications is extended till 30.12.2017. Those candidates who have already applied for TRT vacancies are hereby informed that they need not apply afresh and only need to submit their revised district wise option by utilizing the District Edit Option available on TSPSC website from 15.12.2017 to 26.12.2017. Further in View of Hon'ble High Court Orders, the candidates who qualified in D.Ed..(5pecial Education) are allowed to apply for the post of TGT and the candidates with B.Ed. (Special Education) are allowed to apply for the post of School Assistant and Language Pandite respectively. Accordingly the candidates with above qualification can apply for the TRT Notification as per the orders of Hon‘ble High Court. For further details the candidates are advised to visit Commission’s Website: www.tspsc.gov.in . Imp:TS TRT ONLINE APPLICATION DATE EXTENDED UPTO 30-12-2017 and Edit Option for Change District For Already Applied Candidates from 15-12-2017 to 26-12-2017. Government of Telangana Released GO For Amendments in Teachers Recruitment Rules Released in GO.No 25 As per the Amendments Govt will recruit teachers post in telangana As per Old 10 district. notification And Details are as follows. In exercise of the powers conferred by article 309 of the Constitution of India read with sub sections (3) and (4) of section 169, sub-sections (3) and (4) of section 195 and section 243 of the Telangana Panchayat Raj Act, 1994 (Act No.13 of 1994) and section 78 and section 99 of the Telangana Education Act, 1982 (Act No. 1 of 1982), read with sub- section (1) of section 23 of the Right of Children to Free and Compulsory Education Act, 2009 (Central Act No.35 of 2009) and the National Council for Teacher Education (Determination of Minimum Qualifications for Persons to be Recruited as Education Teachers and Physical Education Teachers in Pre-Primary, Primary, Upper Primary, Secondary, Senior Secondary or Intermediate Schools or Colleges) Regulations, 2014 dt.12.11.2014, the Governor of Telangana hereby makes the following amendments to the Rules for direct recruitment to the posts of Teachers in the Government and Local Body Schools of Telangana issued in the G.O.Ms.No.25, School Education (General) Department, dt.10.10.2017. 2. (1) "Appointing Authority" means, the District Educational Officer of the district concerned in respect of the posts of teachers in Government Schools, Mandal Praja Parishad Schools and Zilla Praja Parishad Schools. 2. (5) “District” means a Revenue District as formed/ reorganised by the State of Telangana w.e.f 11.10.2016.
that was in existence prior to 11.10.2016. 6. The TSPSC shall issue Notification for direct recruitment for the posts of Teachers in accordance with the orders issued by the Government duly notifying the vacancies as per the requisition furnished by the Commissioner & Director of School Education for the 31 Revenue districts as formed/reorganised by the State of Telangana w.e.f. 11.10.2016, taking each such district as the unit of appointment as per the relevant Rules. 6. 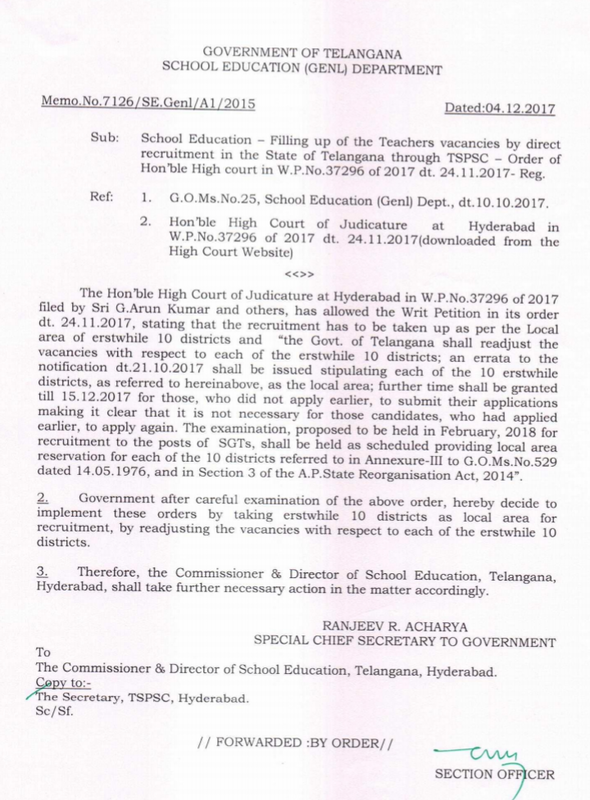 The TSPSC shall issue Notification for direct recruitment for the posts of Teachers in accordance with the orders issued by the Government duly notifying the vacancies as per the requisition furnished by the Commissioner & Director of School Education for the 10 erstwhile districts, taking each such district as the unit of appointment as per the relevant Rules. 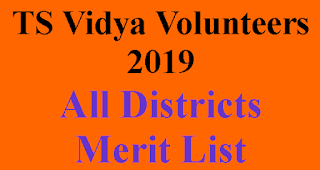 Local Scheduled Tribe candidates shall only be considered for selection and appointment against the vacancies in Scheduled Areas as per G.O.Ms.No.3, Social Welfare (TW. Edn.II) Department, dt.10.01.2000. They shall also be considered for selection to the posts notified in Plain area if they come up for selection. School Education Department of Telangana Memo No .7126 Dated :04-12-2017. 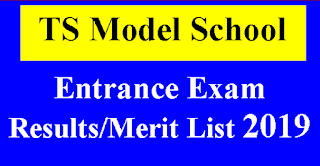 And As per the News Sources Telangana Education Minister Sri Kadiyam Srihari said that on 04-12-2017 Government will Follow Honourable Court Judgement and TS TRT DSC Teachers recruitment Revised/Modified/New Notification with old 10 district Will Release Soon..
Latest Updates Keep Visiting This Site.TSPSC TRT Notification with old 10 district.